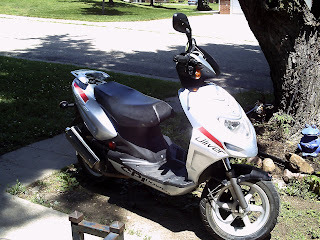 I am so excited Vern came home last night with a present it so much fun to ride I love it. Vern tock me out on it to the old bridge and gave me riding instructions it is only 49 cc so no license is needed. It will be tagged and insured with state farm insurance. 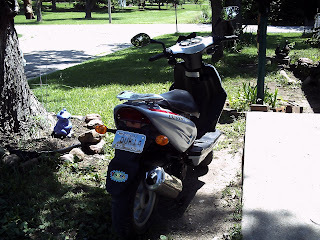 The grand kids have not seen it yet ,I drove up to Roxies on it today and went to the store it has a big trunk under the seat I will have to get a basket for it it will ride two people. It will go 55 miles per hour and you can go 100 miles on one gallon of gas . 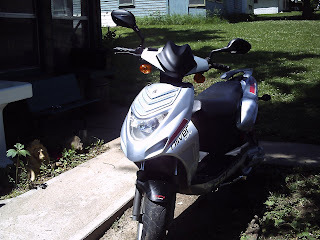 I never thought I would ever own one of these but I was missing out since I started riding mine last night I am hocked. 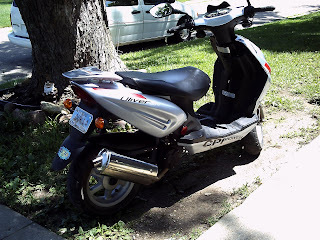 I see why china streets are filled with these scoters they are cool and cheap to use. 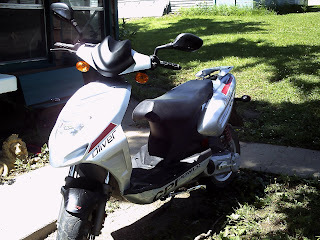 They aren’t that expensive a new one is around 3 grand but 100 mpg you cant go wrong not with gas prices today. I will have to change my mind and let Vern get his Harley now.